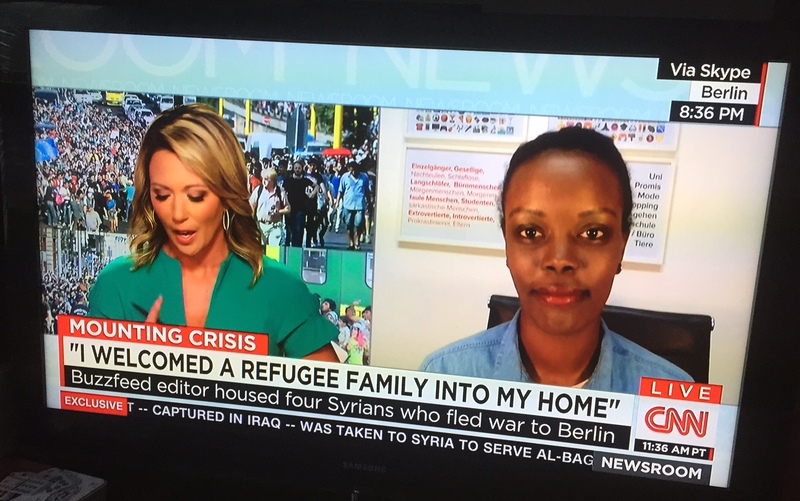 While eating lunch and answering emails today, I was half-watching CNN’s Brooke Baldwin interview a Buzzfeed editor who has taken in a family of four Syrian refugees. As I was only half-listening, I didn’t get the editor’s name and was only able to snag this (terrible) photo of the segment before Brooke cut away. But, what got my attention was something the editor said about the language barrier. Because neither she, nor her husband spoke the language of their new house guests and the refugees don’t speak English or German, they were communicating via WhatsApp and through emojis. Most of us use emojis for fun, not in-depth conversation. And, of course, as a cross-platform messaging app, WhatsApp works for private or group discussions. But, with its translation feature, WhatsApp is the main source of conversation in the house. And, emojis are a quick way for everyone to share needs, concerns and even fears and laughs. So often, we hear stories about younger generations not knowing how to write or spell properly, and many blame texting and the use of emojis. Yet here, messaging apps and emojis are breaking down language barriers and bringing some relief to people who’ve suffered unendurable struggles. What a wonderful use of these tools and what a terrific sign of our times! Language barriers being broken rapidly by communication technology.